Are you looking for a four-door sedan that provides the perfect combination of luxury and performance? Look no further than the Jaguar brand. With a full complement of luxurious, performance-tuned sedan models, the English-based brand will deliver unrivaled thrills and style at every turn. Need help finding the right fit for you? Explore Jaguar-brand favorites with this 2018 Jaguar XF vs 2018 Jaguar XJ comparison at Barrett Jaguar! Classified as a midsize luxury sedan, the 2018 Jaguar XF is available in six standard trim levels – base, Premium, Prestige, R-Sport, Portfolio, and S – that will start at just $47,775. Armed with an arsenal of power-packed and fuel-efficient engine options, the Jaguar XF will check all the boxes. A premium luxury sedan that oozes power, the 2018 Jaguar XJ is available in five grades – XJ, XJL, R-Sport, Supercharged, and XJR – that start at $75,400. With two available wheelbases, the Jaguar XJ will cater to your lifestyle. What Are the Differences Between the Jaguar XF and Jaguar XJ? Power and performance are key aspects of the Jaguar brand that come to light in this 2018 Jaguar XF vs 2018 Jaguar XJ comparison at Barrett Jaguar. 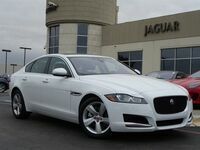 Base Jaguar XF models employ a standard 247-horsepower 2.0-liter four-cylinder engine that is paired with an eight-speed automatic transmission or a fuel-efficient 180-horsepower 2.0-liter turbodiesel. All Jaguar XF models are available with a performance-tuned all-wheel drive system. Driver who want to upgrade performance can opt for the available 340-horsepower 3.0-liter supercharged V-6 or a high-output 380-horsepower 3.0-liter supercharged V-6 that is exclusive to the Jaguar XF S grade. Drivers who choose the full-size 2018 Jaguar XJ luxury sedan can expect an elite level of performance when they get behind the wheel. Even entry-level Jaguar XJ models employ a 340-horsepower 3.0-liter supercharged V-6 powermill that is married to an eight-speed automatic transmission to make 18 mpg in the city and 27 mpg on the highway. Available all-wheel drive will amp up the thrills when you hit the road. If you want an upgrade in performance, the Jaguar XJ Supercharged trim features a 470-horsepower 5.0-liter supercharged V-8 that will sprint from zero to 60 mph in just 4.9 seconds. Top-of-the-line XJR trim levels employ a high-output 550-horsepower 5.0-liter supercharged V-8 power core. Premium luxury is a standard feature of all Jaguar models and the 2018 Jaguar XF and 2018 Jaguar XJ deliver on all counts. A standard eight-inch Jaguar InControl Touch infotainment system provides access to Bluetooth capabilities, Apple CarPlay, and Android Auto. A mainstay in the premium full-size segment, the Jaguar XJ adds a standard adaptive suspension system, adaptive LED headlights, premium leather interior, advanced safety systems, and a panoramic sunroof. Visit Barrett Jaguar today to find a Jaguar model that fits your budget and lifestyle in San Antonio!